Pharma Franchise For Ophthalmic Medicines – Get a variety of eye care medicines at the best rates in India for monopoly based PCD franchise. Biofield Pharma is a leading pharma franchise company in India to bring you a quality range of ophthalmic drug medicines and products range. These consist of multiple eye drops, ointments etc covering antibiotic, anti-infectives, anti-inflammatory, anti-allergy etc. Those who want genuine business opportunities of pharma franchise for ophthalmic medicines can contact us for better results. Eye medicines have a huge market in India which is growing at a good rate. Those who are looking for affordable business expansion should invest in ophthalmic medicines. Biofield Pharma offers pharma franchise for ophthalmic medicines in India. They are fully prepared in GMP & WHO units that follow strict rules and regulations. Strict quality actions are embraced by us to ensure that you get safe, effective and durable eye drug products. Best packaging solutions of vial have been used to store eye solutions. You can trust our company for better quality and reasonable pricing in the market. Our company is a well known Pharma Company for eye care medicines in India. We bring you a host of quality medicines for marketing in India. The ophthalmic medicines are manufactured in quality units that are subjected to flexible standards that raise output, quality, and efficiency. An ISO certified company, Biofield Pharma is a trusted company in India known for its genuine business opportunities. More than 300+ people are connected with the company for PCD franchise dealerships. Those in search for quality ophthalmic medicines can invest in our company for great opportunities. You will be offered quite a vast business space where you could do all your business operation. The profit margin in eye medicines is quite fascinating as you will earn a good amount. The expansion and scope rate of ophthalmic medicines market is good and you could get a good growing business. We have been very religious about the quality control methods that are applied by our company; Biofield Pharma has its own set of manufacturing units that are situated in excise free location. They have been certified with GMP & WHO with global guidelines strictly being followed by us. We always ensure that our company follows strict guidelines for eye care medicines. Quality has been the superior priority of Biofield Pharma and thus, thoroughly strives towards it. The vial solutions are made using sterilized containers which are subjected to full safety and durability depending on the nation of topical solution. The eye medicines are prepared with 100% surety of safety, effectiveness, and durability. 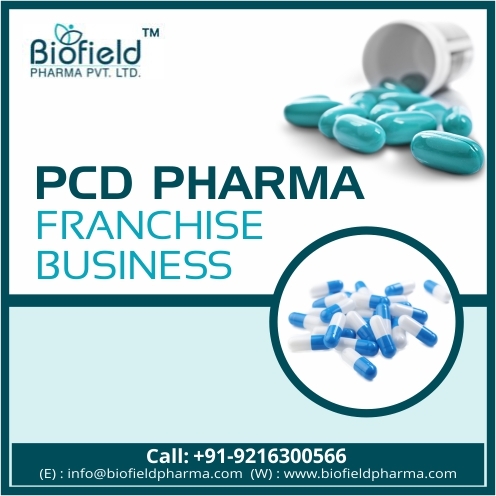 Why Invest in PCD Franchise Business at Biofield Pharma For Ophthalmic Medicines? Our company welcomes all those who are seriously interested in starting their own business. We have been offering affordable business opportunities across India for ophthalmic medicines. If you think you have the conviction and are serious about starting their own business then Biofield Pharma is the best to collaborate for a business opportunity. You will be offered reasonable rates of medicines. The margin on sales is good here at Biofield Pharma. You will be offered an impressive list of Marketing tools free of cost. Enjoy instant delivery of your orders. Monopoly rights with wide business locations.